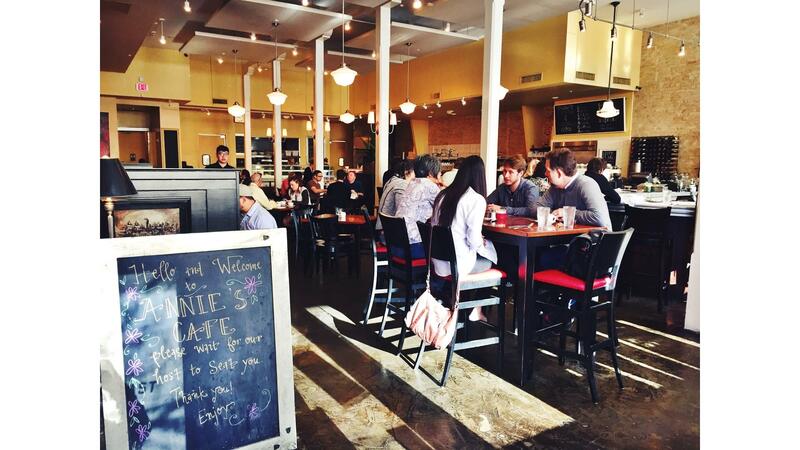 Rent Annies Café & Bar | Corporate Events | Wedding Locations, Event Spaces and Party Venues. Our commitment remains to local, simple, house-made, scratch-kitchen classics, and we utilize local and/or organic items when we can. The oldest restaurant downtown, Annies Cafe & Bar is Love Nance’s continuation of Austin’s 30+ year favorite Apple Annies. After losing the lease in 2008 at its long-time downtown location, Annies Café & Bar purchased and restored a larger space, in the historic Day Building, on Congress Avenue. While still featuring favorite recipes drawn from Love’s small-town roots featured at the original Apple Annies location, Annies extended service at the new location to include breakfast, lunch, full bar, dinner and brunch service. Our commitment remains to local, simple, house-made, scratch-kitchen classics, and we utilize local and/or organic items when we can. We use only all-natural fresh ingredients in our made-from-scratch catered cuisine. Please place your order 24 hours in advance whenever possible. Catering is available for delivery or pick up. A small delivery fee will be added to all delivered orders. Please notify us if you need disposable cutlery. Please place weekend orders on Thursday. A 25 person minimum is requested for weekend catering orders.